The education field is going through a quick digital transformation. As machines undergo changes, many scientists agree that computers are going to take over the world in the near future. In the end, electronic devices make our lives easier, and artificial intelligence saves us a lot of precious time. The educational system has a lot to benefit from expanding technology. For once, students have more access to fast learning. Technology has increased students' productivity greatly over the past two years. Personalized learning has made education available to everybody by using an easy approach to information sharing. High-schoolers have access to the latest tools available on the market, while educators can easily provide innovative methods of teaching in the classroom. Take a look at the latest transformational trends available online, and try them out! Nowadays, students studying history can go back to Ancient Rome and take a quick glance at the prehistoric world. Those interested in geography can now travel to Antarctica and see the driest place on Earth with their own eyes. Arts majors are even able to visit museums, and see famous paintings. And all of that for free thanks to Virtual Reality. Apps such as Expeditions or Google Arts and Culture are becoming more and more popular. 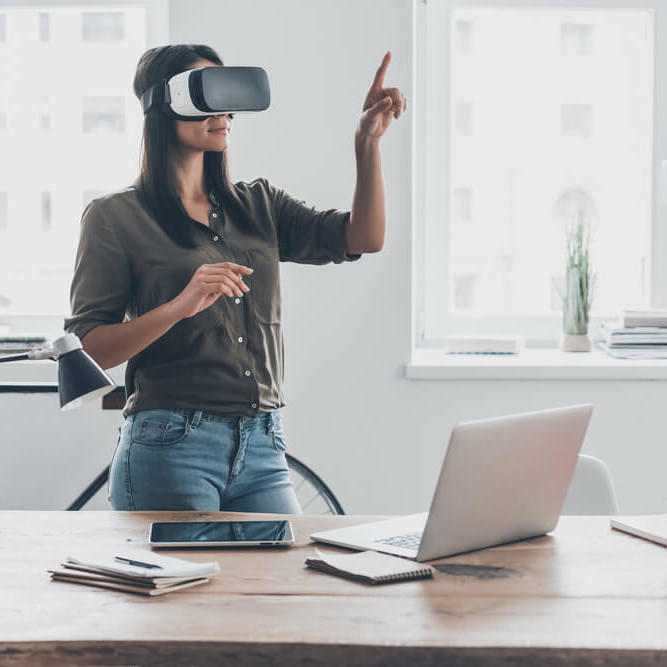 Most students cannot afford travelling, so these amazing VR tools give them the amazing opportunity to be in the right place, at the right moment, by paying no fees. It is literally a dream come true! High-schools and universities have to keep up with the developing technology. Most of them invest in new classroom devices that will benefit the students. No more “bring-your-own-device” rubbish! Now students get to work on brand new iPads and PCs, all of these funded by the government. The US Government is one of the many examples of countries that decided to revise their educational system. Governors agreed to spend more money on education, and set more accurate goals for the future. Subsidizing public education by purchasing new learning devices is a great step towards great changes. Using new systems similar to Siri, students can now get help with their homework much easier. Chatbots like Robbie or BRiN replace the old school way of learning. E-learning has become the rock star of technology. Artificial Intelligence is now able to provide human-like support to thousands, if not millions of students all over the world thorough these smart apps. There are multiple one-on-one tutoring apps, numerous counselling chat bots, and various grammar-enhanced learning educational tools – all of them available online! E-learning makes school easier for both students and educators. It gives students the opportunity to make decisions about the school content that they are covering. It also helps them find the best method of learning that fits their necessities. Personalized learning also gives educators the opportunity to focus on improving their teaching methods. On top of that, if the students work more by themselves, they will come to class more prepared. That offers professors more time to help each student with their academic needs during class. Play games and learn! This modern trend mixes educational goals with fun activities. The games represent real life situations or actuality issues. Watching students react to these scenarios helps teachers understand how their minds work. Students acquire not only important knowledge, but also a different perspective on the world through gaming. The games provide instant feedback, so they keep the pupils interested in acquiring new knowledge. If you walk into a modern classroom today, you are going to see numerous SMART boards, and a whole new classroom design. The students' desks are not pointed towards the front of the class anymore. The chairs face each other, creating a friendly workish environment. Students must get used to informal settings that resemble their future offices. All the new technology and virtual tools available today increase student performance. Living in this modern era, we cannot afford to lose time. The increased usage of artificial intelligence enhances our productivity rates, and allows us to breathe at the end of the day. Without expanding technology, we would probably end up working 25 out of 24 hours per day. So, dear students, enjoy the new era, and make use of all the available technology!